Streamlines importing media into Final Cut Pro. Is there a better alternative to Loader? Is Loader really the best app in Video category? Will Loader work good on macOS 10.13.4? Loader is a companion application for Final Cut Pro that streamlines the process of importing media. 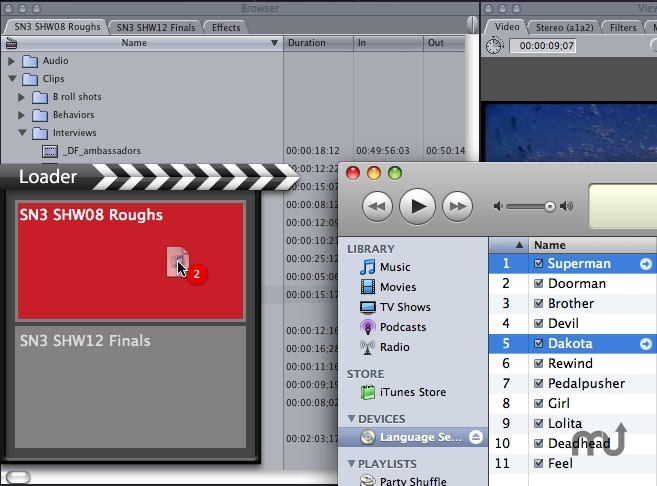 Importing music, sound effects, graphics or movies into Final Cut Pro is a task that most editors do many times a day. In order to keep media files in one place for a particular project, it has traditionally been necessary to first copy the files to a media folder and then import the copied files into Final Cut Pro. Loader handles both of these processes automatically and adds some extra benefits. [CHG] For compatibility with OS X 10.7 Lion, serial number file is now written to '/Users/Shared/Digital Heaven/Loader/Loader Serial Number' rather than '/Library/Application Support/Digital Heaven/Loader/Loader Serial Number'. Loader needs a rating. Be the first to rate this app and get the discussion started! Loader works alongside Final Cut Pro (launching and quitting automatically) and appears as a small tab on the left side of the screen. When tracks from iTunes or files/folders from the Finder are dragged onto the tab, it slides out to reveal a list of projects currently open in Final Cut Pro. After dropping the items onto the desired project, Loader copies them in the background to the assigned media folder linked to that project. In addition, those audio file formats that don't play nicely in Final Cut Pro (.caf, .m4a and mp3) are automatically converted to an AIFF file before import. When the copy is complete then the copied files are sent to a new bin in Final Cut Pro. Loader also offers the ability to sort copied media into subfolders according to the file extension. By default, subfolders are automatically created for audio, graphics and movie file types and settings can be changed at any time to suit specific requirements.